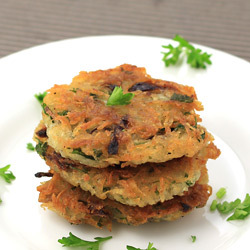 Mashed Potato Pancakes, a delicious and easy finger snack, is a perfect party food or anytime snack made from mashed potatoes. It is generally served with variety of toppings and condiments ranging from sour cream, cottage cheese to even fruit syrups like apple and maple syrup. There is no other better way to use leftover mashed potatoes than making crisp and buttery pancakes from it. Combine mashed potatoes, milk, all purpose flour, crushed garlic, chopped green onion, ground black pepper and salt to taste in a bowl and mix well. If dough is too dry, then add additional 1 tablespoon milk. Divide it into 8 equal parts and form 1/2-inch thick patties. Heat butter in a non-stick skillet over medium-high heat. Place 2-3 patties over butter and cook over medium-low heat until golden brown on bottom side. It will take about 3-4 minutes. Turn patties and cook another side until golden brown and crispy. Transfer prepared pancakes to serving plate. Cook remaining patties. 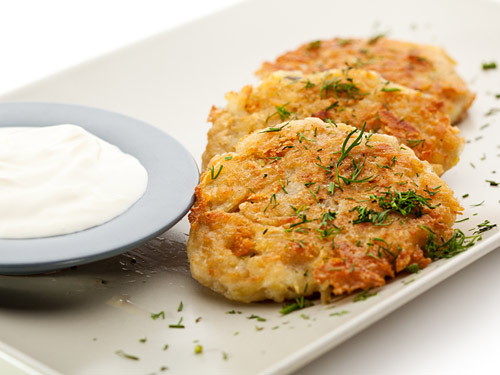 Crisp mashed potato pancakes are ready to serve. Garnish with finely chopped cilantro or cheese and sour cream. If potato mixture is getting stuck to your fingers and prohibiting you from making patties, then grease your hands with oil. Add parmesan cheese while making dough to make tasty cheese flavored pancakes. Taste: Mild spicy, crispy outside and soft inside. Serving Ideas: Serve it for breakfast.